A farmstead near Boise City, Oklahoma, 1935. ARLINGTON, VA – November 12, 2012 – PBS announced today the release of an exclusive 50-minute preview of THE DUST BOWL, the much-anticipated film by Ken Burns, will premiere on the free PBS for iPad and PBS App for the iPhone and iPod touch beginning Monday, November 12, 2012. The film will air nationally on Sunday-Monday, November 18- 19, 2012, 8:00-10:00 p.m. ET on PBS (check local listings). 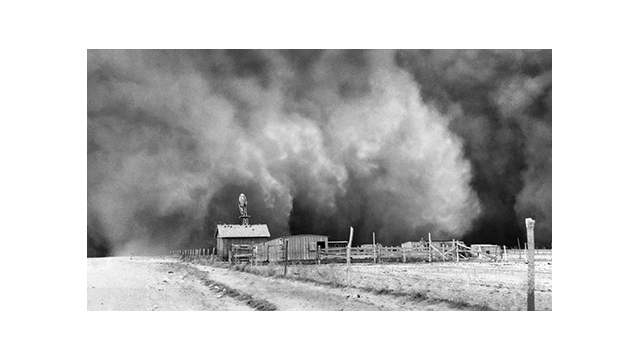 THE DUST BOWL chronicles the environmental catastrophe that, throughout the 1930s, destroyed the farmlands of the Great Plains, turned prairies into deserts and unleashed a pattern of massive, deadly dust storms that for many seemed to herald the end of the world. It was the worst manmade ecological disaster in American history. In addition to the preview prior to the national broadcast, Burns will participate in a virtual town hall at 2:00 p.m. on Wednesday, November 15, 2012. The national YouTube event, live from WNET’s Lincoln Center studio in New York City, includes Paula Zahn and will be streamed at youtube.com/pbs. Panelists will discuss current drought conditions, as well as the importance of environmental awareness and the effects humans have on the natural world. Join the conversation at youtube.com/pbs. Submit questions at youtube.com/pbs or #DustBowlPBS. The PBS App is available for free from the App Store on iPhone, iPad and iPod touch or at www.itunes.com/appstore.